Some of the team (plus mascot and coach!) after the game. 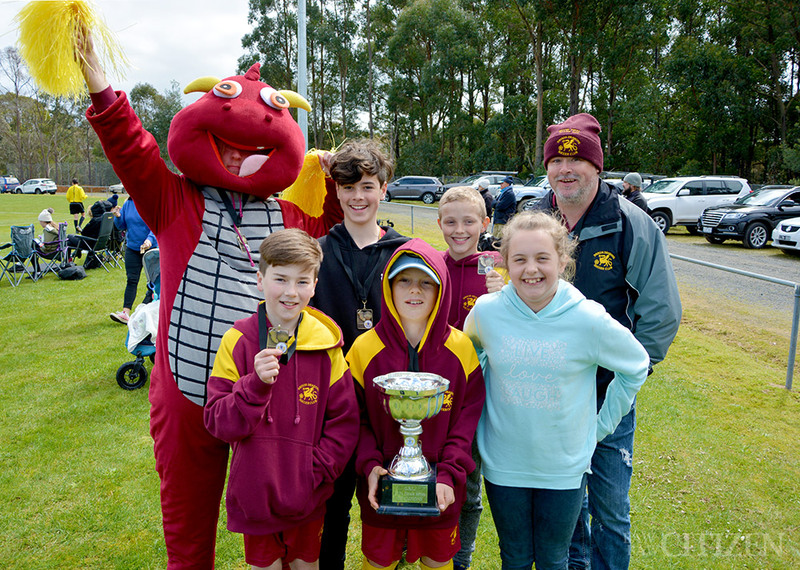 Gippsland Soccer League ~ An early start to the season has ended with a 4-0 victory for Drouin Dragons Under 12 Mixed over rivals Leongatha Knights on Sunday. First published in the 28 September 2018 edition of the Baw Baw Citizen. Get your copy free from retailers across Baw Baw! The victory ended a strong season for the team, but it didn’t come easy. “That was awesome, a good feeling,” coach Alan Silver told the Baw Baw Citizen after the game. “The boys played really well. It was a pretty tough game, there was pressure on both sides and Leongatha played a fantastic game as well. Drouin also had to work hard for goals in the grand final game, despite how the scores might make it look. “It’s a good number to have as a win in soccer for sure,” Alan continued. The season started unusually early for the side too, and that might have been key to the team’s success. “This year we certainly drilled them pretty hard on the training sessions, on the drills we did,” Alan said. “We actually started the season a month or month and a half earlier than what we’d normally start at. “We played well and we won!” he told the Baw Baw Citizen. “I really enjoyed playing. It was good to play with the team and actually play competitively. Much of the team, including coach Alan, will move on to Drouin’s Under 14s next season. “Looking forward to seeing what bunch of kids we get, and hopefully we work well with them and can get another good, strong side out of it,” he said.